“Check the shoreline for surf scoters. We’ve got a couple hundred reported from San Leandro Marina to Hayward Shoreline that may be ‘oiled’.” This was a call that came into the Crab Cove Visitor Center, where I work as a naturalist for the East Bay Parks, last Friday morning, January 23rd, at about 9:30am. I took a co-worker out with me and we began our walk from the visitor center down the shoreline. We saw a couple of eared grebes in the cove that were unusually close to shore and bathing vigorously. Usually eared grebes stay further offshore unless they were catching fish close by. Rounding the concrete wall, my heart sank. Dotting the shoreline were small groups of beached surf scoters. 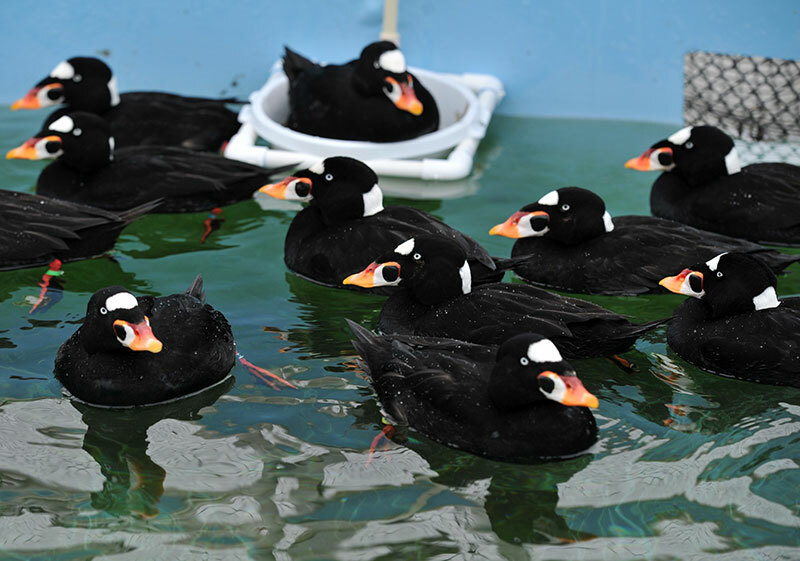 Normally, surf scoters only come to shore when they’re sick or injured –- or to breed in the tundra of northern Canada and Alaska. They’re sea birds in the diving duck family with feet set far back on their bodies, perfect for maneuvering underwater but very unbalanced for walking on land. We counted about 50 surf scoters that were swimming closer to shore than normal, preening and bathing with about a dozen sitting on the beach. I knew we would need help to try and capture as many as we could to get them to a wildlife care facility. We didn’t (and still don’t know) what the substance was, but it was sticking their feathers together, ruining their insulation and waterproof layer. These birds would die of hypothermia or from ingesting the chemical while preening. It was important to get them some help as quickly as possible. I contacted Mark Taylor, Park Supervisor at Hayward Regional Shoreline. His park was “ground zero” for the impact of the spill and he was already coordinating with California Department of Fish and Wildlife, the Office of Spill Prevention and Response (OSPR) and International Bird Rescue (IBR) to capture sick birds, collect dead ones and get the chemical tested. 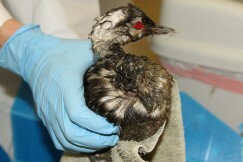 It was terrible scene with nearly 300 sick or dead birds affected by the goo. We got our Crown Beach ranger-naturalist team together and patrolled the shoreline with a successful first catch of a surf scoter near Crab Cove. Into the box he went. We tried to catch several more, but they were still healthy enough to run in and swim out to deeper water. We walked south along the beach and the rangers took their truck to check the bird sanctuary at the south end of the beach. Most of the birds that we saw in the morning seemed to have disappeared, likely riding the outgoing tide further into the bay. We spotted a group of three scoters that were sitting far out into the low tide zone. We successfully netted one and put it in a carrier for transport. A volunteer with a vehicle full of contaminated seabirds from the Hayward Shoreline stopped by late in the afternoon to pick up our birds and take them to IBR in Fairfield. I’m glad to hear that, after cleaning and care at IBR, 20 were released Wednesday morning at Fort Baker where the herring run will provide plenty of food for them. IBR still needs donations to offset the high cost of caring for these birds since no one has yet been found responsible for the chemical spill. You can check in on the recuperating birds on the IBR webcam.